Everyone entered the ballpark on Sunday worried about a wash out. Huge, violent storms were predicted to start close to game time. But instead of rainstorms, the Phillies provided thunder with their bats in the final game against the Brewers. 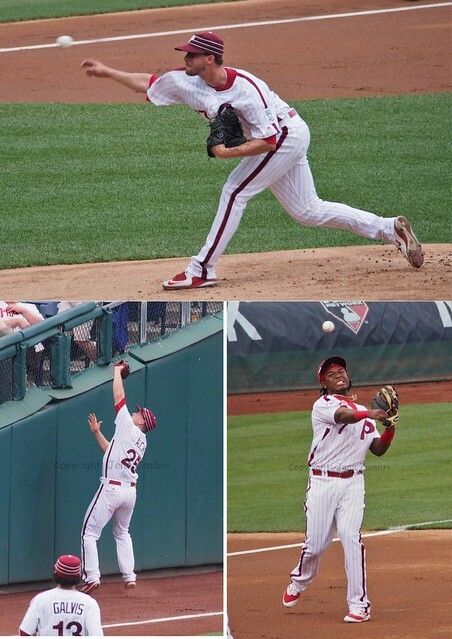 It was another Retro Night at the ballpark, so the Phillies wore 1970’s uniforms. 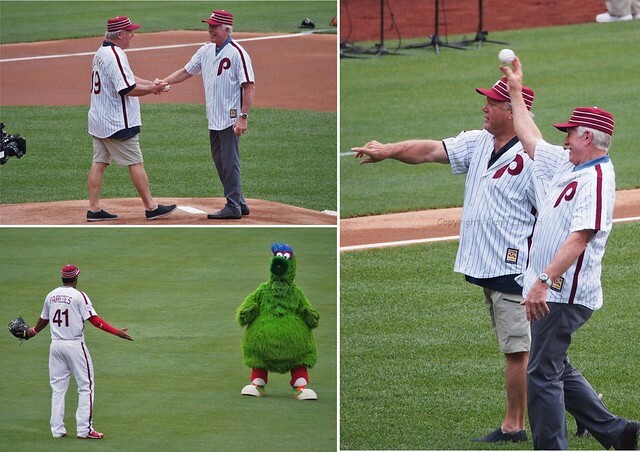 They also brought Mike Schmidt and Greg “The Bull” Luzinski to toss first pitched in honor of the 70’s. And of course, no 70’s revival is complete with the streaking Phanatic. Aaron Nola started the game and, despite getting into some rough spots, he pitched very well. Nola did not allow a run over 6 innings, striking out 9 Brewers. The defense pitched in, as well, to keep runs off the board. And then the Phillies bats suddenly came to life. Odubel Herrera had his 4th 4-hit game of his career. The only Phillies position player without a hit was Freddy Galvis, but he did collect an RBI on a sacrifice. Luckily, newcomer Jimmy Paredes took over and hit a no-doubt-about-it 3-run homer. Not to be left out, Cameron Rupp smashed a solo shot right after that. The Phillies scored 5 runs in the inning, which is their highest total in an inning this year. 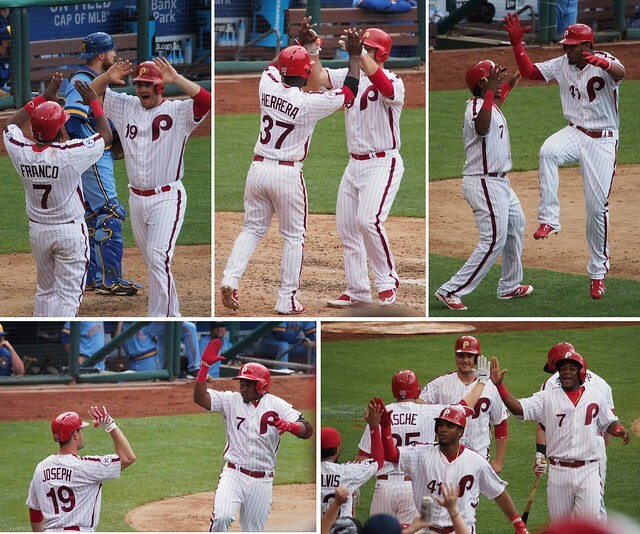 The Phillies went on to win the game easily by a score of 8-1. They were able to split the 4-game series with the Brewers, which is great considering how sluggish this offense has been lately. Today the Phillies chose their 53rd manager by promoting Pete Mackanin from Interim Manager to the permanent role…at least for the next year. Pete played for the Phillies in the late 1970’s and is now the 8th person to have managed, coached and played for the team. Larry Bowa, who is the current bench coach, is also a member of that club. This move is not a surprise. The team really began to come to life after Mackanin took over when Ryne Sandberg ran off. While youth, trades and injuries have made it impossible for them to win much, the Phillies have at least looked like a team that is trying since Mackanin was put in charge. 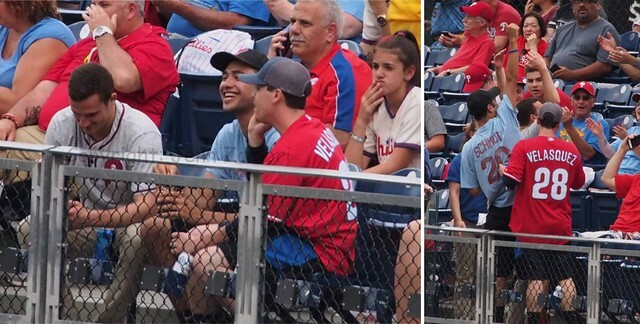 He has also kept the youngsters in line, like when he benched Odubel Herrera this past Sunday for throwing a tantrum after an at-bat. Herrera seems to have taken the lesson to heart and apologized to Mackanin earlier today. This is a good sign that Mackanin can bridge the gap with this team from awful to, hopefully, competing again in a few years. 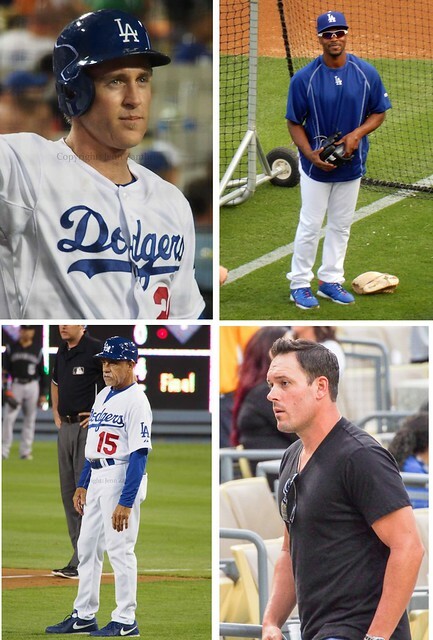 So, totally off topic, I recently went to Los Angeles to a Dodgers game to see Chase Utley and Jimmy Rollins play in blue uniforms. I took a tour of the stadium before hand, which was very interesting. The stadium itself is huge and not easy to find your way around, but Emma from Dodger Blue World was nice enough to give me a quick tour of the upper deck, which was very cool. The view from above is amazing! Thank you, Emma! The game itself was a very strange one. The guy sitting next to me said he had been going to Dodgers games for 30 years and that day was the first time it had rained while he was there. Yes, I went all the way to L.A. to get rained on. So by the 4th inning, the camera was put away for good as I did not bring my usual Philly rain gear. But I did manage to get some pictures before the 16 INNING ordeal ended. 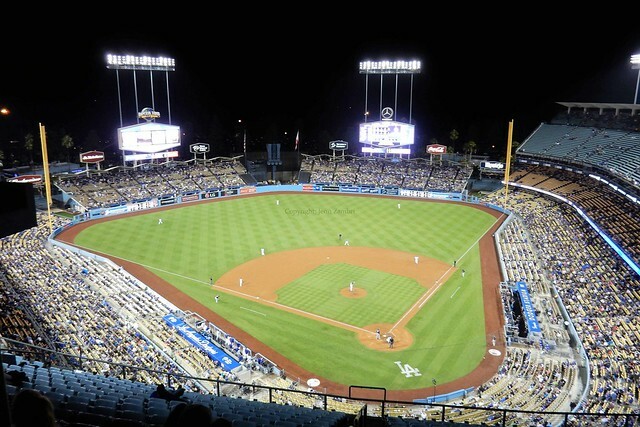 Yes, 16 innings….and the Dodgers lost. But I had photos to Chase and J-Roll to cheer me up! I also saw Davy Lopes and….believe it or not…GREG DOBBS! I have no idea why he was there watching the game, but I got a shot of him too. It was an ex-Phillies reunion. If anyone is interested, here is the full Photo Album from the pre-game tour and the start of the game. I also visited Petco Park in San Diego, but am still working on those photos; I will post those in the next week or so. 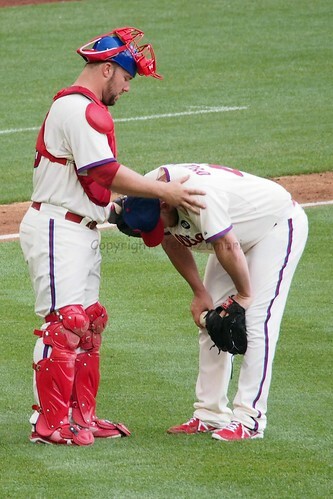 In the meantime, it looks like the Phillies might actually win a game tonight….shhhh! I should not say that too loudly. Cross your fingers that the Marlins stay quiet. The Phillies have been on quite a roll lately, winning their last 3 games against the Braves and 12 out of 14 since the All-Star break. 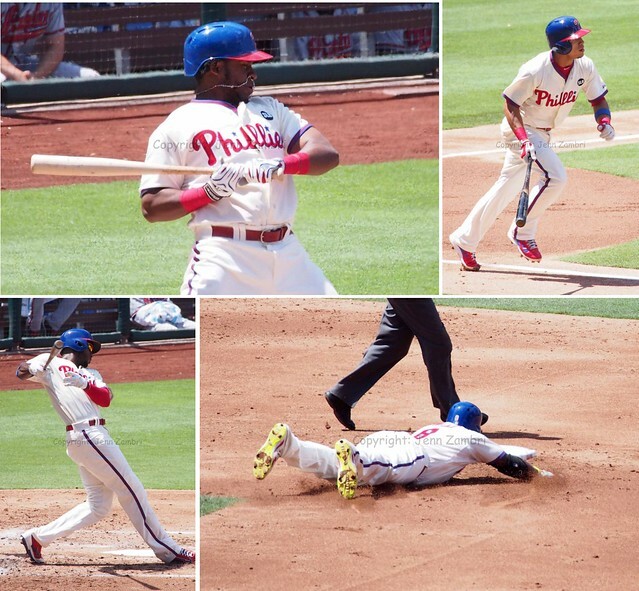 But today, the Phils momentum puttered out as they lost to the Braves, 2-6. Rookie Adam Morgan started the game and went 5 innings allowing 4 runs with 7 hits and 3 walks. He did not look awful except for all the walks and the big 3-run homer, but that was all it took today. Morgan certainly kept the outfielder’s busy. Defense was mostly very good but a lot of balls kept squeezing through the infield. And the super-hot Phillies offense was certainly cooled off by Julio Teheran, who apparently only pitches well against the Phillies. There were many swings and misses and dull grounders tossed about, with the exception of a few solid hits in the 2nd and 5th innings. Cody Asche and Odubel Herrera accounted for the only two RBI in the game. 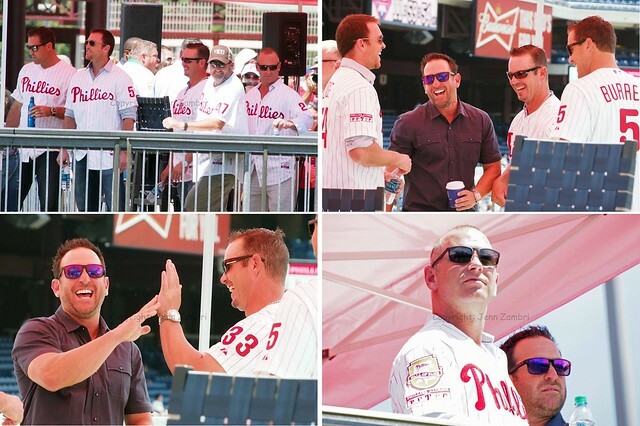 There were many Alumni on hand over the weekend, so at least that was entertaining. Today I saw Pat Burrell, Aaron Rowand, Brad Lidge, Matt Stairs, Nick Punto, Mike Lieberthal, Scott Eyre, John Kruk and Mariano Duncan. They all appeared to be having a good time. Probably Burrell had the most fun. He was inducted into the Phillies Wall of Fame yesterday and I got a good look at the plaque today. I also got a good look at Pat celebrating by smoking….eh…something? You be the judge. Clearly, he is unaware of the advent of the zoom lens. But this whole episode does go a long way towards explaining the purse he was seen carrying around all weekend. Ok, the Phillies claim it is a “satchel.” Whatever the case, I guess he really needed it to carry his….eh….important stuff? How is that for investigative reporting? LOL! Here is the full Photo Album from today’s game and pre-game Behind the Pinstripes taping. Well, it is official. This is the worst start to a season that the Phillies have had since the 10-22 start in 1997. Today’s loss to the Mets gives the Phils an 11-21 record, which is spectacularly awful. They have been bad in all areas; pitching, offense and defense. Even the bullpen, which was supposed to be the highlight of this team, has been sub-par. But just to keep us watching, there are a few glimmers of hope here and there; but none of them long-lived. When pitcher Chad Billingsley smashed a solo homer today in the 3rd inning, the small crowd exploded. While it was very exciting, Billingsley crushed the celebratory atmosphere in the top of the 4th by giving that run back to the Mets, who continued to score until Billingsley was finally pulled in the 6th. Even with the 1-5 deficit, the Phillies kept pushing for a comeback. A string of hits in the 7th inning brought the Phillies to within 1 run of the Mets. But Jeanmar Gomez proceeded to give the Mets 2 more runs in the 8th. The 4-7 hole was one the Phillies meager offense simply could not climb out of. On a lighter note, Happy Mother’s Day to all the mom’s out there! Darrin Ruf’s mom, dad and wife joined him on the field before the game, which was a bright spot of the day. Despite their struggles, the Phillies actually had a good shot at sweeping the Nationals today to end the 3-game series. But they apparently had one thing working against them: Ryan Howard. I hate to be so blunt about it, but Howard absolutely stunk up the ballpark today. He struck out to end an inning 4 times, all with runners on base; and 3 of those 4 times, he had runners in scoring position. One would think after more than 10 years in the majors, he would learn to stop swinging at balls in the dirt; no such luck. Howard is now batting .150 only 6 games into the season. But on to more positive things… Sean O’Sullivan got the spot start today and rewarded the Phillies for their confidence in him. O’Sullivan lasted 6 innings, allowing 2 runs on 5 hits and 1 walk. Overall, he looked good and kept the team in the game. 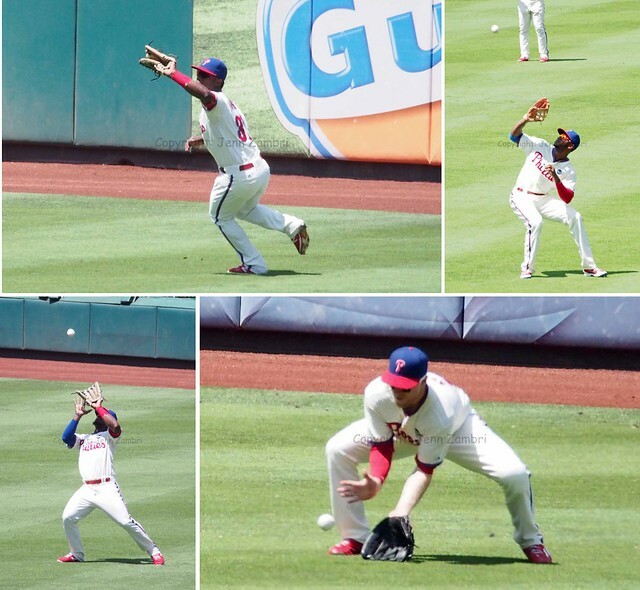 Odubel Herrera, the rookie Rule 5 pick, continues to wow fans with his speed and hustle. After hitting the walk-off winner in last night’s game for his first major league hit, Herrera collected 2 more hits today plus an RBI and a stolen base. Cody Asche also had another great game with 3 hits, an RBI and a walk, putting veterans like Howard to shame. Asche is batting .429. 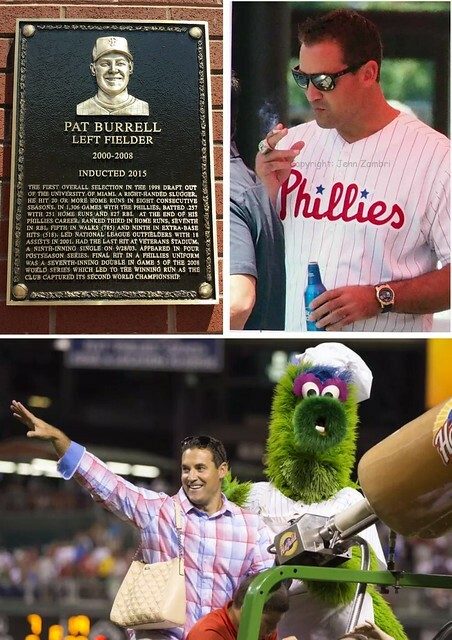 Eventually, Darren Ruf replaced Howard in the game and began with a home run in the 7th to put the Phillies in a 2-2 tie, just like the night before. But unlike Saturday’s game, the Phillies could not come back in extra innings to win. Although, they never stopped trying, which was nice to see. Even after the bullpen allowed 2 runs in 10th, the Phillies scored in the bottom of the inning and then fell just short of the win, losing by a score of 3-4. So there have been several encouraging signs to start the season, even though overall, this team is probably not going far with the youth they have and the dried up veterans. But it was a good game with some energy, which the Phillies have been missing the last several years. Also, I just want to give kudos to pitcher Jerome Williams. Going back to last year, Williams is always out engaging with the fans and signing autographs, unlike most of the players. Today, he even scooped up what appeared to be a 3 or 4 year old fan out of the stands and played catch with him. He then literally picked the kid up and handed him back to his parents. It is a rarity to see a major league player truly appreciate his position and give back to the fans to consistently. The Phillies are lucky to have him! So the team is off to New York for an early game tomorrow against the Mets. Cole Hamels will pitch and the game starts at 1:10pm. And here is the full Photo Album from today’s game.